A three star walkthrough for levels 21-25. Cut The Rope: Holiday Gift is now available to download from the App Store, and we've already got you covered with a three star walkthrough for the first and second sets of levels. To finish things off, here's a walkthrough for the final five levels of the game. Good luck! When the candy swings to the left, cut the rope so that it lands on the lowest star and gets a bubble. Float up until you've caught the highest star, then pop the bubble to drop the candy in the stocking. When you emerge in a bubble, wait for the tethered rope to be vertical then cut it. Float up to get the final star, then pop the bubble as soon as you've picked it up. Cut through both ropes at the same time with two finger-swipes. The candy will fall towards the first star but you need to use the bottom air cushion to stop it falling off the bottom of the screen. Once it's above the second air cushion, tap that one instead until the candy goes through the stocking. Once you've got the second star, let the bubble float up as high as possible before dropping into the red stocking. You need maximum height to make it up towards Om Nom on this stocking teleport. Swipe the bottom rope to be catapulted into the stocking. You'll acquire a new rope and bubble upon exiting and float up to the second star. Wait for the ropes to go taut, then pop the bubble and cut the left-hand rope. Now cut the second rope to send the candy into the purple stocking. At the other end, the candy will fall into a bubble. 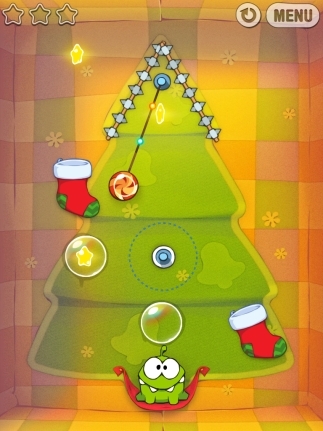 Float back up through the purple stocking to get the final star, then pop the bubble to travel through to Om Nom. You need to be careful with your timing here. The idea is to cut the rope with the right amount of delay, so that when you fly out of the rotating purple stocking, you'll hit the top-right star before hitching onto a rope and grabbing the final star. Practise this until you get the timing right, then make a final cut through the rope to drop the candy in Om Nom's mouth. Cut the right-hand rope to hitch a ride on the rocket. From here, you'll travel through a collection of stockings. Once you've collected the second star, swipe the rope to head back through the stockings. You'll collect the final star in your last big orbit, then all you need to do is cut the rope to feed Om Nom the delicious candy.